Happy Friday, everyone! Thanks for coming back to read about our quick adventure in Boston! This is definitely a town where you can “see” all of the sights within an hour or two, but definitely need a whole weekend to fully “immerse” yourself in the culture and food! 11. Old State House - the Declaration of Independence was first read to the people of Boston from the balcony here! Side Note: YOU GUYS, THE FREAKING DECLARATION OF INDEPENDENCE WAS FIRST READ HERE. Take a minute to let that soak in! It was insane to be at this very spot, on a very busy intersection surrounded by the new buildings of Boston, where our great nation became a free country. ON THIS BALCONY! Mindblowingly cool, if you ask us! 12. Old City Hall - one of the original Latin schools where Benjamin Franklin (father of electricity amongst other things) went to school. When we got there, it was pretty cool for us to see some sort of reenactment made by the soldiers that we saw over at the Old State House. 13. New State House - we dropped by to take a quick walk through the New State House. There’s really not that much to see inside, but we loved this little flag room that they had! We would suggest skipping unless you needed a bathroom break ;) Head on over to Anna’s Taqueria a few blocks away for a quick taco snack - we each got one and honestly I regret just not eating dinner here instead because you guys the tacos were sooooooooooooooooooo good and the flavors were absolutely authentic! 14. Beacon Hill - voted one of the cutest neighborhoods in America by Thrillist. Honestly, we say skip it unless you plan on doing a photo shoot here. It is literally a cobble-stoned, residential neighborhood. Acorn Street is the most popular here, but there are a lot of tourists just taking pictures. 15. Boston Commons / Boston Public Garden - America’s oldest park and first botanical garden. It’s almost as if the whole city lives here! It was very lively and filled with squirrels (who are not afraid of humans at all). 16. Trinity Church - we walked past here on the way to stop #17. It had the first “pneumatic door check” which is a fancy way of saying that the doors don’t slam as you close them ($$ for a tour). 17. Boston Public Library - this public resource holds approximately 19 million volumes, making it the second-largest in the United States, only behind the Library of Congress. The reading room here is *famous* on Instagram/Pinterest for good reason. But we found it a little awkward trying to take a picture as people studied here! 18. Boston Marathon Finish Line - we ended the day here as it was right outside the Boston Public Library. Be careful if you want a picture because there is oncoming traffic on non-marathon days. 19. Dinner at Caramelina’s - we headed back to the hotel to freshen up & then took an Uber back to the North End. Make reservations ahead of time on Yelp (the only way they take reservations) and ask for a table by the front windows! I also told them we were celebrating a birthday on the reservation, and to our surprise they brought each of us a free glass of the house wine! How sweet! Brandon and I split the Caprese Risotto which was out of this world delicious! We highly recommend getting this as a risotto rather than a salad. I ordered the gorgonzola pasta; Brandon the seafood pasta. Both were absolutely excellent. What made us love this place even more was the staff. We noticed a gentleman dining alone at the bar behind us; he didn’t speak much English. With the words he knew, he tried to order a pasta and both the guy at the front and our waitress were so helpful in taking his general likes and suggesting a dish he would enjoy. This totally warmed our hearts and honestly, I think every time we come to Boston, we will make a stop here because of the kindness of the staff! 20. Boston Cream Pie at the Omni Parker Hotel - because Caramelina’s doesn’t serve dessert, we walked 15min towards Omni Parker Hotel to grab some of the famous Boston Cream Pie! The hotel is absolutely lavish (I wish we could stay there without draining our savings!!) and the “pie” was out of this world delicious. We were stuffed from dinner, but somehow we left craving more of this light, fluffy dessert! Head up to the bar area if you just want some of the pie, because the restaurant is for diners who are there for a full meal. What a perfect, whirlwind tour of Boston! We both fell in love with the city and cannot wait to come back for a proper weekend here! Do you have any tips or insider knowledge on where to go in Boston? Happy Wednesday, everyone! We hope your week has been going well :) The weather has cooled down significantly here in Denver (we are expected to be in the low to mid-40s!) and it had me thinking about the weather we had when we went to Boston a few weeks ago. I was really worried because a friend of ours had left the area a few days before we were set to land and she said that they had experienced some effects from Hurricane Florence as it was tumbling in the Atlantic. The forecast called for overcast skies and some rain, which is exactly what we ended up getting. The dreary weather wasn’t too much of a detractor for us when we were in Boston itself since we were inside a lot (B accompanied me for moral support during some personal ~werk~ I had in the area), but I was hoping for at least some clear skies so we could walk around the city before dinner. Given the time constraints, I was a little worried that we may not get to stop everywhere. But folks, hiking in Colorado came in handy, because walking at sea level on flat ground was a piece of cake and we were able to walk through the entire city! The historic sites are all along the Freedom Trail, which is ~3mi, so we got to hit all the stops within the better part of the hour. Keep in mind, we didn’t get to go inside the houses/churches in order for it to fit in our time crunch, but that was OK with us. Follow along as we bring you along our version of Boston! 1. Fenway Park - “take me out to the ballgame,” HERE to start off this scavenger hunt! This was right by our hotel, so we just walked here before taking an Uber across town. We skipped the Bunker Hill Monument (the start of the Freedom Trail) but instead we went to #2, below. 2. Site of the Great Molasses Food - This was considered Boston’s version of Pompeii, as 40ft waves of Molasses rushed down Commercial Street at a speed of 35mph. (On a side note, like WOW! Classify this under weird things I would never believe until I saw the plaque commemorating this event). 3. Old North Church - The oldest standing church in Boston, first opened to worshippers in 1723. Fun fact: it played a role in alerting the colonists that “the British are coming”! There are tours available of the inside for $$ (we didn’t go so we could keep on going). 4. Statue of Paul Revere - “the British are coming” is a quote WRONGLY attributed to him. Note: there was restoration going on when we visited, so the area was blocked off by a chain link fence. We were able to get this gorgeous shot of the statue with the Old North Church in the background by holding our camera up close to the holes in the fence. 5. Paul Revere’s House - the oldest remaining structure in downtown Boston! You can take a tour of the inside ($$), but again we skipped that. 6. Mike’s Pastry - “Holy THIS”; It is the best known Sicilian pastry sold at Mike’s Pastry on the North End. We lucked out as it was the downtime, and had no wait to get a cannoli! There is no formal “line” - the cashiers take whoever has their order ready so we were helped before a huge tour group who technically got there before us. We tried the espresso cannoli and it was delicious! We had to split it given it was so large! 7. Union Oyster House & Green Dragon Tavern - the oldest restaurant in the United States + the pub where it was reported that the Boston Tea Party was planned! 8. Faneuil Hall / Quincy Market - built by wealthy merchants. We were told to stroll through; Quincy Market is really a marketplace where there are a ton of food stalls! Seems to us that it would be a pretty busy place during the week! 9. 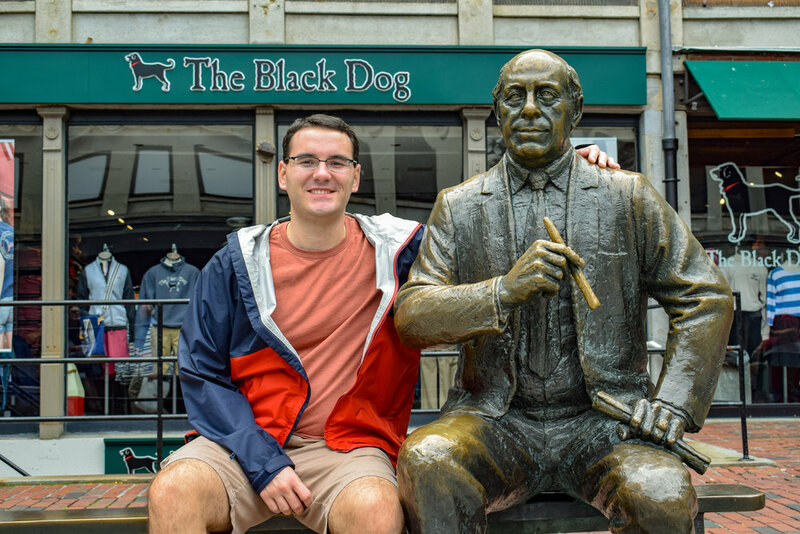 Statue of Reed Auerbach - smoke a cigar with him, who was head coach when the Boston Celtics won 9 NBA championships (only behind Phil Jackson of the Chicago Bulls). They also have little shoe imprints if you have the desire to step into his shoes. 10. James Hook & Co - we took a quick detour to the harbor for lobster rolls from James THIS & Co, similar to a pirate’s fake hand. Brandon got the small lobster roll and thought it was OK. When in Boston, right?? & with that, we are most of the way through our “mini” tour of Boston. We wish we had more time to actually have gone inside the various historic landmarks, but this just means that we will have to take an actual vacation there to fully immerse ourselves in the city. Come back on Friday for the last few stops on our list and to see what we thought of dinner in the famous Italian North End!